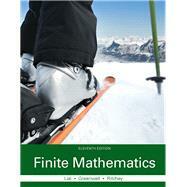 by Lial, Margaret; Greenwell, Raymond N.; Ritchey, Nathan P.
Finite Mathematics, Eleventh Edition by Lial, Greenwell, and Ritchey, is our most applied text to date, making the math relevant and accessible for students of business, life science, and social sciences. Current applications, many using real data, are incorporated in numerous forms throughout the book, preparing students for success in their professional careers. With this edition, students will find new ways to help them learn the material, such as Warm-Up Exercises and added “help text” within examples. Marge Lial (late) was always interested in math; it was her favorite subject in the first grade! Marge's intense desire to educate both her students and herself has inspired the writing of numerous best-selling textbooks. Marge, who received bachelor's and master's degrees from California State University at Sacramento, was affiliated with American River College. An avid reader and traveler, her travel experiences often found their way into her books as applications, exercise sets, and feature sets. Her interest in archeology lead to trips to various digs and ruin sites, producing some fascinating problems for her textbooks involving such topics as the building of Mayan pyramids and the acoustics of ancient ball courts in the Yucatan. Raymond N. Greenwell earned a B.A. in Mathematics and Physics from the University of San Diego, and an M.S. in Statistics, an M.S. in Applied Mathematics, and a Ph.D. in Applied Mathematics from Michigan State University, where he earned the graduate student teaching award in 1979. After teaching at Albion College in Michigan for four years, he moved to Hofstra University in 1983, where he currently is Professor of Mathematics. Raymond has published articles on fluid mechanics, mathematical biology, genetic algorithms, combinatorics, statistics, and undergraduate mathematics education. He is a member of MAA, AMS, SIAM, NCTM, and AMATYC. He has served as governor of the Metropolitan New York Section of the MAA, as well as webmaster and liaison coordinator, and he received a distinguished service award from the Section in 2003. He is an outdoor enthusiast and leads trips in the Sierra Club’s Inner City Outings program. Nathan P. Ritchey earned a B.A. in Mathematics with a minor in Music from Mansfield University of Pennsylvania. He earned a M.S. in Applied Mathematics and a Ph.D. in Mathematics from Carnegie Mellon University. He is a Professor of Mathematics and Chair of the Department of Mathematics and Statistics at Youngstown State University. He has published articles in economics, honors education, medicine, mathematics, operations research, and student recruitment. Nate is a Consultant/Evaluator for the North Central Association's Higher Learning Commission and regularly participates in program evaluations. In recognition of his numerous activities, Nate has received the Distinguished Professor Award for University Service, the Youngstown Vindicator's "People Who Make a Difference Award," the Watson Merit Award for Department Chairs, the Spirit in Education Award from the SunTex corporation, and the Provost's Merit Award for significant contributions to the Honors Program.